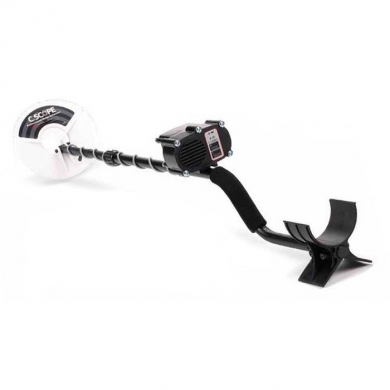 The C.Scope CS880 Metal Cover Locator is a very useful handheld metal detector which can be used for finding buried metal surfaces such as manhole covers, hydrants and stopcock covers whether they are covered by earth or by tarmac. It is therefore perfect for ground contractors working in the water industry. The depth range depends on the thickness of the buried metal but a normal manhole cover is detectable from roughly 90cm. The location of any buried metal surface is relayed to the user by an increase in the click rate of the C.Scope CS880. This can be heard either through the loudspeaker or via headphones thanks to the integrated audio jack whilst the adjustable click rate allows the user to choose between greater depth range or more precise location, depending on circumstance. The ergonomic design of the C.Scope CS880 means it can be operated easily without placing any strain on the user. The length of the stem is adjustable and there is a comfortable grip with an arm rest. The controls are extremely simple and the search coil is fully submersible with an IP67 ingress protection rating. Eight AA batteries power the device for over 100 hours and the locator provides reliable results every time.